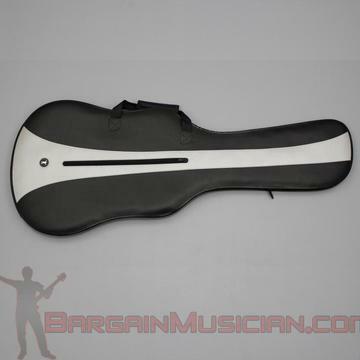 Great Quality Durable Leatherette Guitar Gig Bag. - Padding is about 1" thick on both sides. - Strap system holds your guitar securely in place. - Synthetic leather patch on the inside near headstock to prevent strings from poking through and tearing. - Has a handle and backpack straps. - Approximately 44" long and 16" wide at the guitar body bottom.